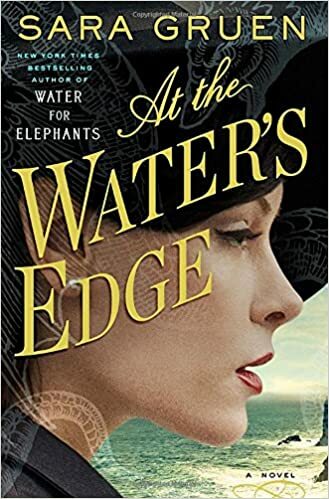 I loved Sara Gruen’s Water for Elephants, and hated her follow up, The Ape House. At the Water’s Edge fell somewhere in between for me, leaning a bit more towards liking it (I think?). Set in the 1940s, At the Water’s Edge stars slightly bratty Maddie Hyde, her extremely bratty husband (Ellis) and his equally bratty best friend (Hank). They flit around from party to party, getting drunk and making fools of themselves. After one particularly bad night, Ellis gets into a huge fight with his father (who already resents Ellis for staying out of the war due to a color blindness that was discovered when he tried to enlist) and gets kicked out of the house. Ellis & Hank become convinced that they’ll be able to prove themselves to society (and Papa) if they go to Scotland with the last of their money, and find the Loch Ness monster. This is not without precedence — Ellis’s father claimed to have found it in his youth, but was proven to be a liar. So if Ellis finds it, it would be a particularly good “f*** you” to his dad. Maddie, who has a “nervous condition” and NO backbone, gets dragged along on the adventure. These people will make you crazy for the first quarter of the novel — at least. They’re so spoiled and obnoxious and out of touch (with poor people, with the war, with non-Americans, you name it). You will feel immense joy when bad things happen to them. But eventually, Maddie starts to learn a bit more about what other people are going through — she makes friends with the locals in the town where they stay (on the loch), and realizes that her lifestyle isn’t necessarily what she wants. She also realizes her marriage lacks spectacularly in several areas. Ooh, and isn’t that local man handsome? Poor Ellis…all he lacked to be a total villain was a mustache to twirl. He never stood a chance against Angus, the hunky Scotsman that Maddie eventually becomes completely infatuated with. Beyond his drinking and carousing, Ellis is a liar, a coward, occasionally violent, terribly rude, a sexist, a classist, and a secret drug user who couldn’t get it up in bed. Oh, and I felt like maybe the author was hinting that he and Hank were more than friends (the pictures? come on). 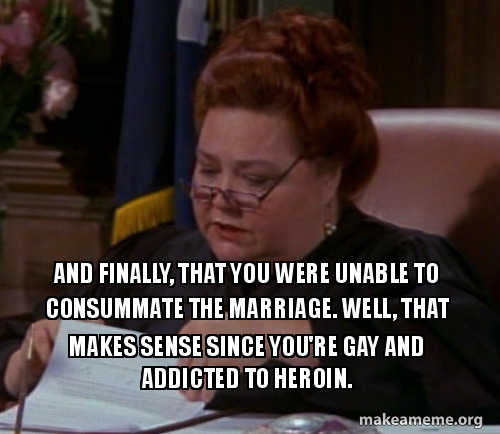 All in all, it kept reminding me of that annulment scene on Friends. Look, I think most anyone reading this will be already slightly inclined to root for the quiet, rugged Scotsman with the troubled past versus the rich American brat. You don’t have to stack the deck quite so fiercely, Gruen. But the story begins to grow on you (as does Maddie — although she does continue to weep, shriek and tremble a lot), and while the monster metaphor is a bit heavy-handed, it’s still a decent read. Share the post "Here there be monsters"